Tom Ford Eyewear has arrived! The long awaited and much anticipated arrival of Oakley has occured. Please stop by and check them out. Please come by and see our newly remodeled office. We've increased our frame capacity from 600 to over 1500 frames. We hope you love the new look! Introducing Tory Burch, Marc By Marc Jacobs and Fendi! Please stop by to look at our newest frame lines! Due to the final stages of our remodel project we will be closed Friday the 29th for patient care as well as for glasses and contact lens pick-ups. We will re-open for patient care on Tuesday September 2nd. We apologize ahead for any inconvenience this may cause. Holiday Schedule. Office Closed Monday July 7th. We will be open for patient care Saturday July 5th, but closed on Monday July 7th. Thanks for your understanding. For the week of 4/14-4/18 we will be closed during the lunch hour from 12pm-1pm. We apologize for any inconvenience this may cause. We are excited to annouce that our remodel project has officially begun. Please pardon our dust. The office will remain open during construction with the occassional closure as needed. We apologize for any inconvenience this rennovation may cause. Thanks for your understanding. Paul Frank Eyewear is here! Saturday December 22nd thru Tuesday December 25th we will be closed. We will re-open at 8am on Wednesday December 26th. We will be closed on New Year's Day as well. Happy Holidays! $1400 OFF Lasik. 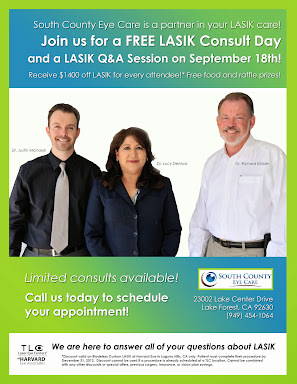 Join us for a FREE Lasik Consult day with TLC…SEPTEMBER 18th. Limited availability. RSVP with Debbie @ 949/454-1064 soon! For the month of June we will be open on the 3rd and 5th Saturdays of the month instead of the usual 1st and 3rd Saturdays. We apologize for any inconvenience. We are now offering free Wi-Fi during your visit!!! Use those Flex Spending Accounts soon! 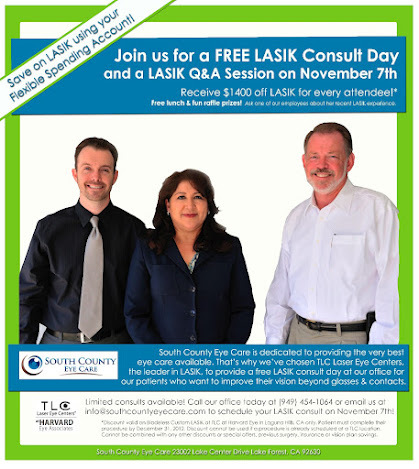 Join us for a free Lasik Consult day on Nov 7th. $1400 OFF of a Lasik procedure with TLC @ Harvard Eye Associates for those in attendance. Call (949) 454-1064 to register. Limited consultations available. 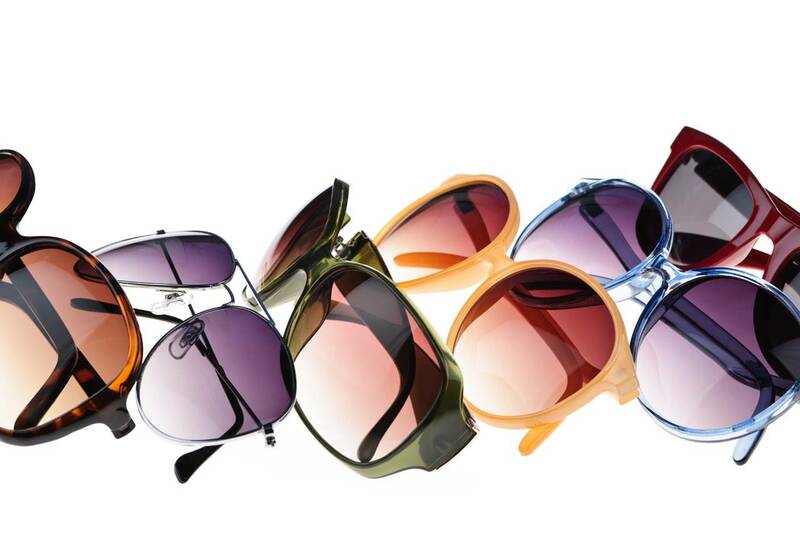 Win a Free Pair of Ray Ban Tech Sunglasses (Like Us On Facebook by October 31st to enter)! Eyeglasses Special…Expires Sept 30th (click for details)!